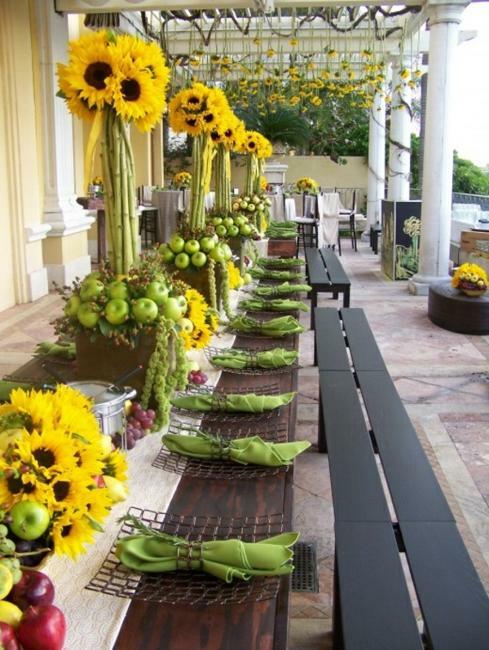 Sunflower floral arrangements and wedding decorations are unique, bright and quite beautiful. 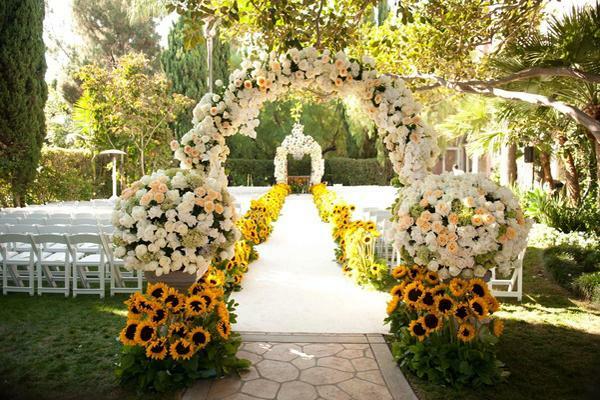 These flowers are large and spectacular, bringing optimistic and happy yellow color into the special events. 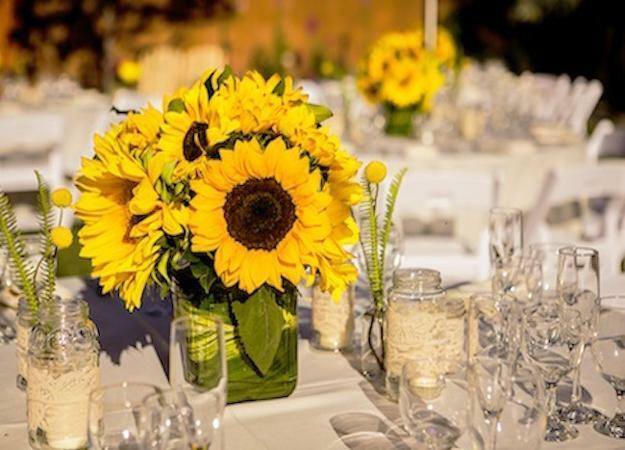 Decor4all shares a collection of charming summer party and wedding decorating ideas, bringing inspirations for themed decorations and sunflower floral arrangements. 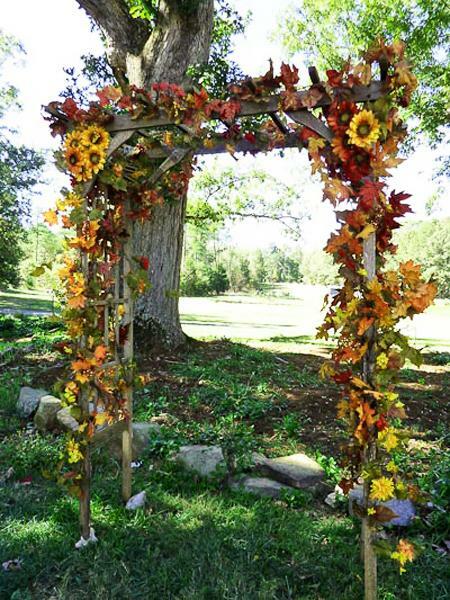 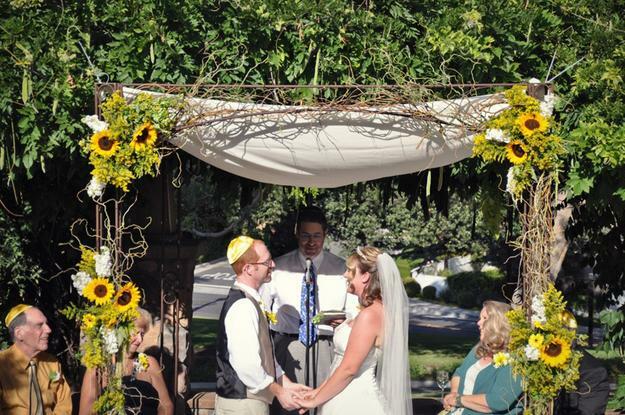 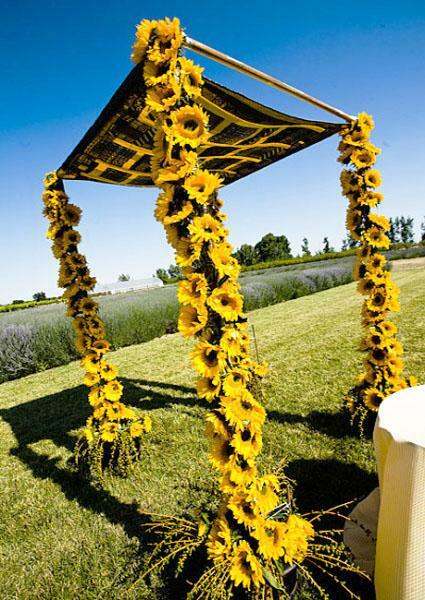 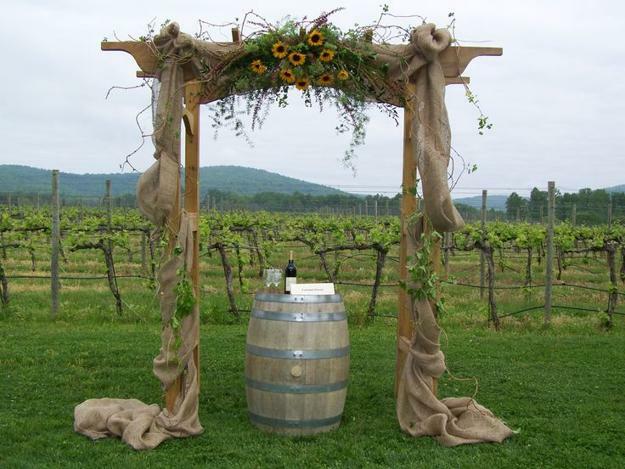 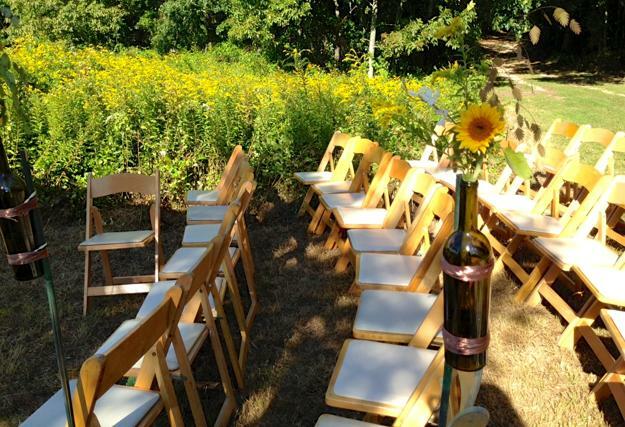 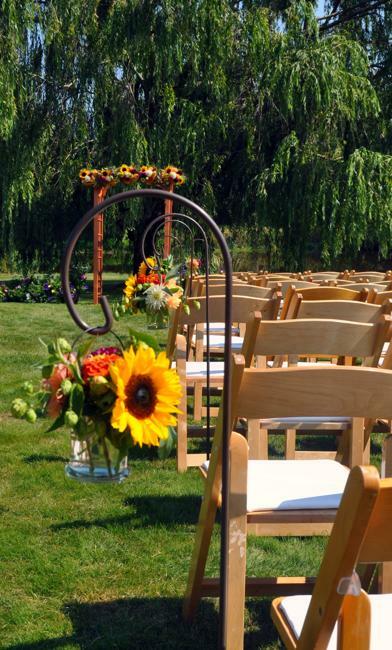 Sunflower wedding decorating is a nice choice of the summer event decor theme. 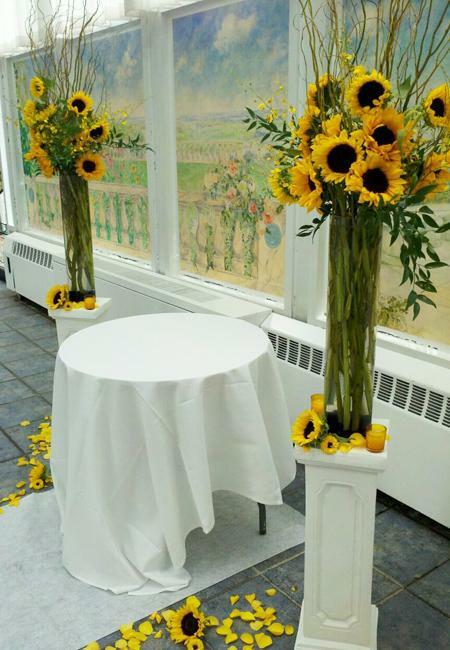 Sunflowers are versatile, meaningful and bright. 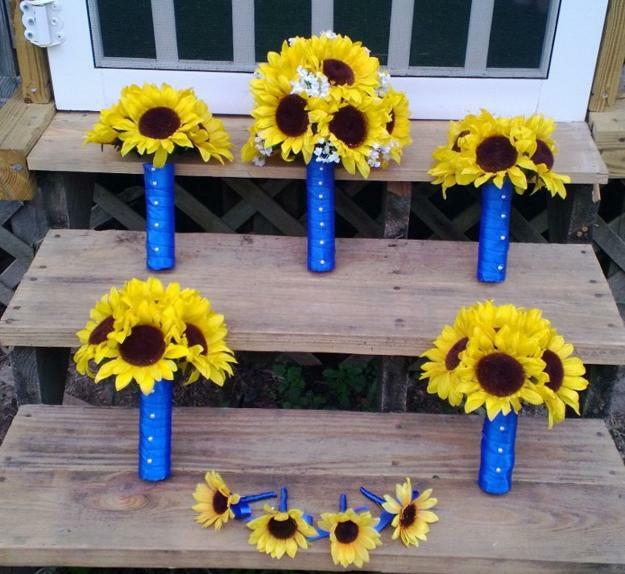 The sunflower decor theme is suitable for church and home decorating. 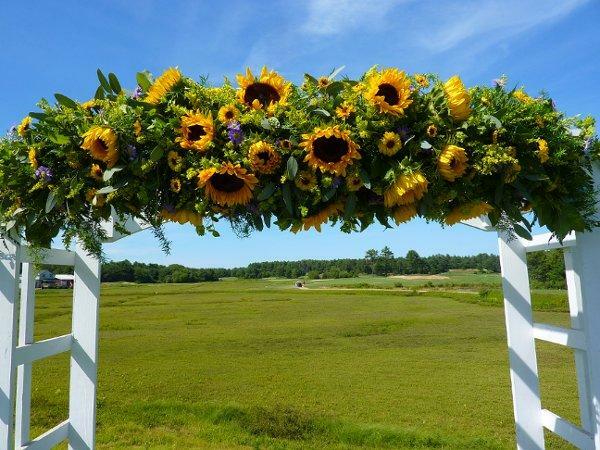 Sunflower floral arrangements look gorgeous with green grass and trees, decorating lovely yard or garden. 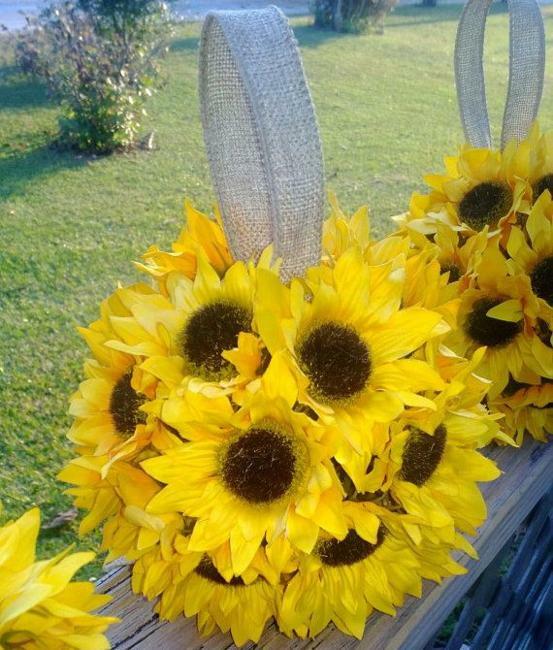 Sunflowers add bright yellow color which is happy and sunny, perfect for a beach wedding or just about any location. 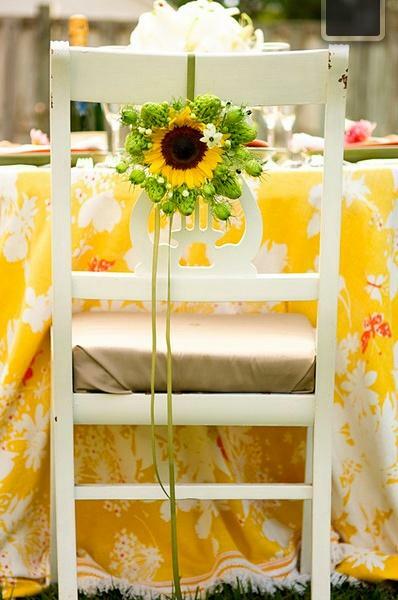 A sunflower color theme is bright, exciting and vigorous. 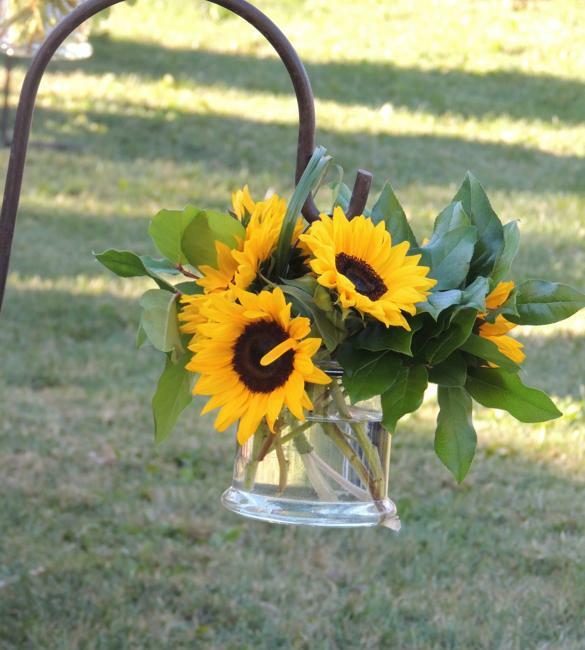 Sunflower floral arrangements in the dominant yellow color are warm and sunny. 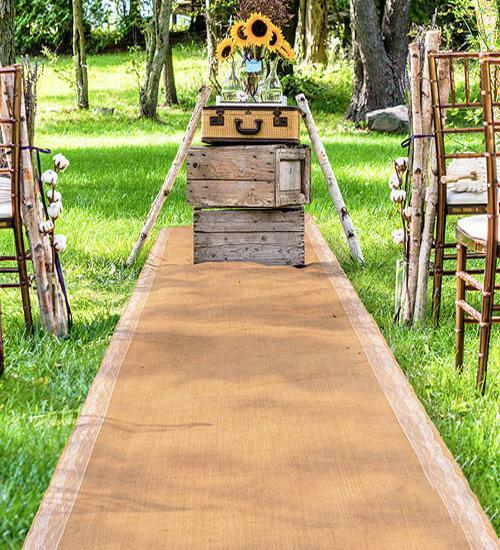 Yellow color can be combines with comfortable brown, orange and red colors to create natural and inviting look. 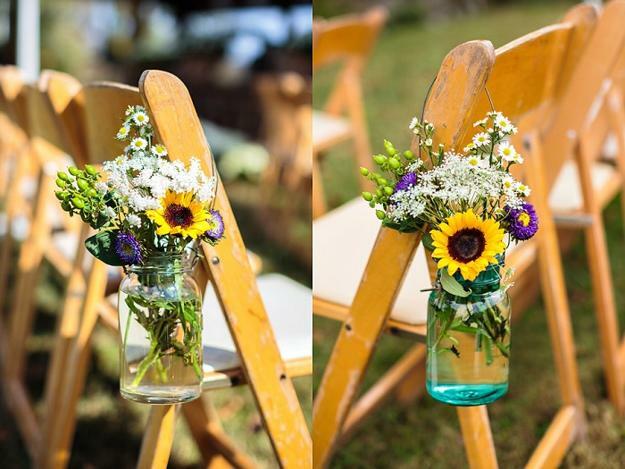 Green and yellow color combinations look bold and bright, and all blue colors, light and deep purple colors just increase the impressive and bold effect. 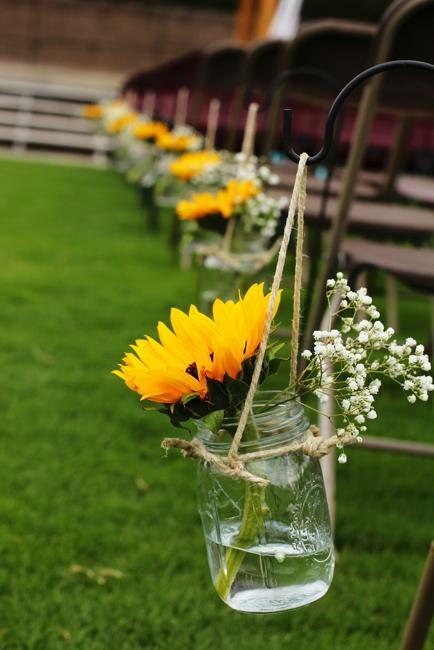 Vases with sunflowers and charming, hanging decorative balls made with these beautiful flowers are absolutely adorable. 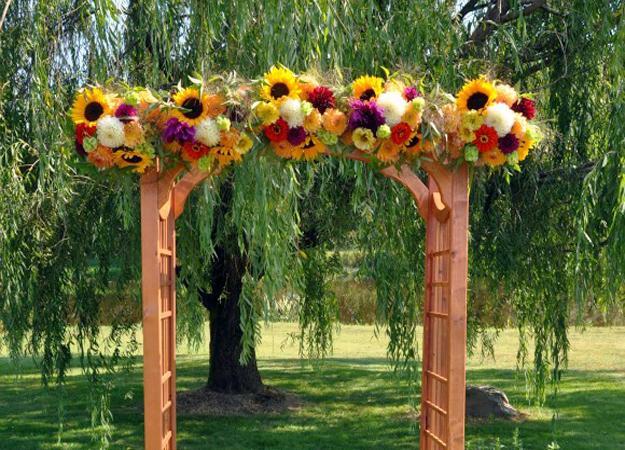 These summer flowers come is many sizes and yellow color shades, creamy white, peach and yellowish orange color shades. 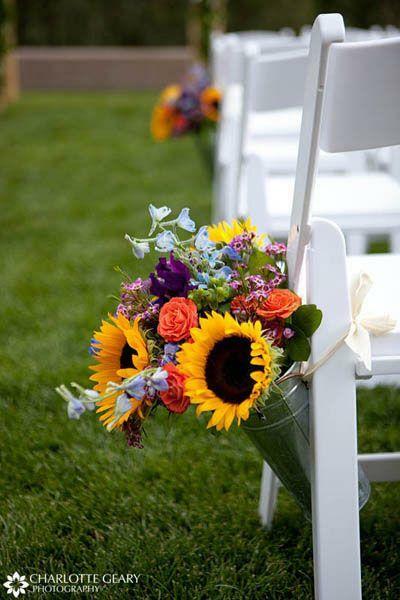 Sunflowers mix well with all small flowers, green plants ad leaves. 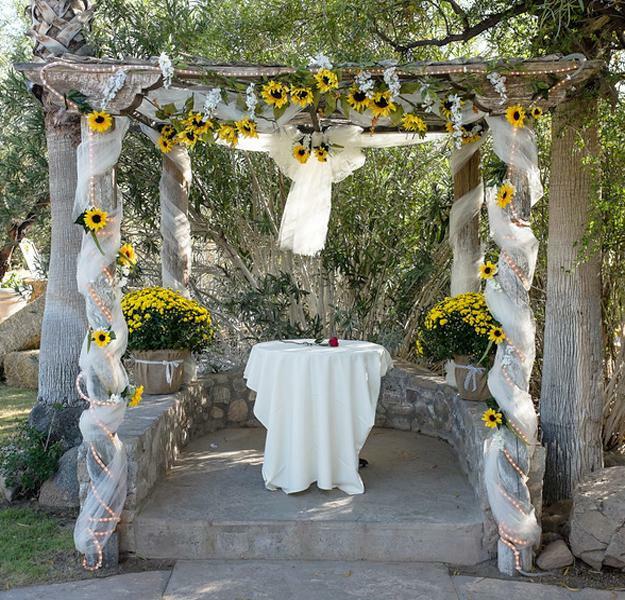 Gerber daisies and yellow mums can be used for creating beautiful wedding decorations and floral arrangements with sunflowers or without them. 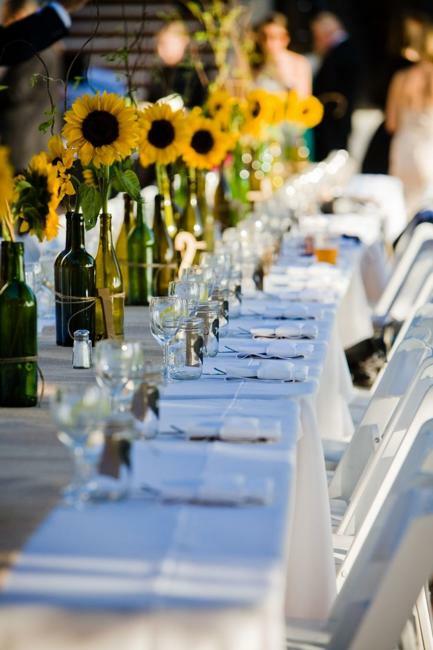 Floating table centerpieces with sunflowers look adorable. 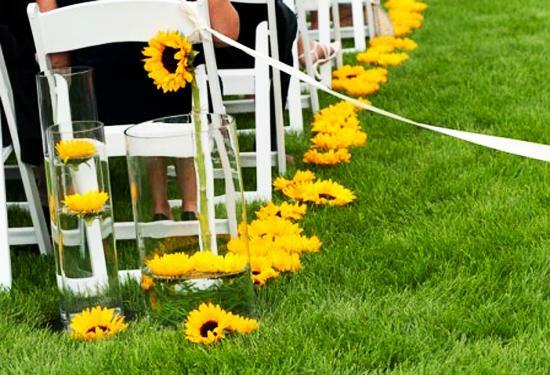 Cut the stems from these summer flowers and float the blooms in shallow bowls, creating stunning summer party table decorations in bright yellow color. 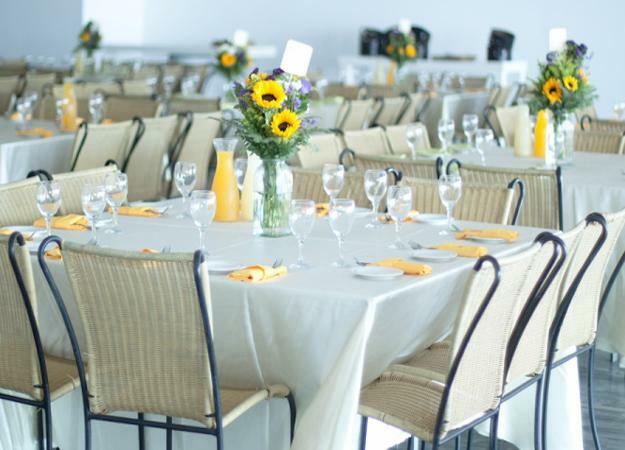 White decorating ideas with sunflower table centerpieces and chair decorations made ribbons in white and yellow colors look spectacular, adding bright contrasts and fresh look to summer party table decor and wedding decorating. 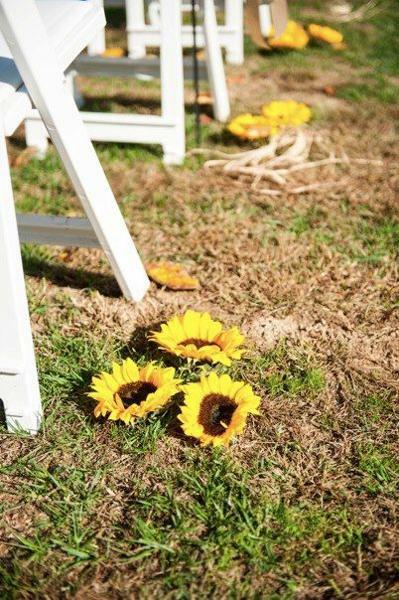 Sunflowers are beautiful flowers that give great inspirations for wedding cake decoration and cupcakes. 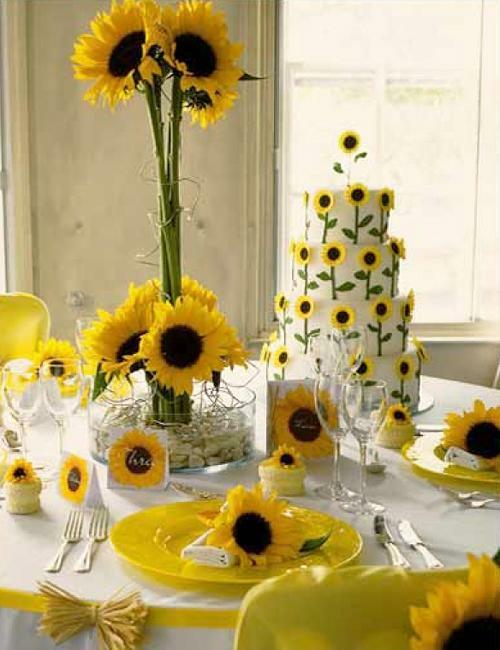 Creating sunflower designs with icing and cupcakes makes these edible decorations even more unique and attractive and offers a cheery way to welcome guests to taste them. 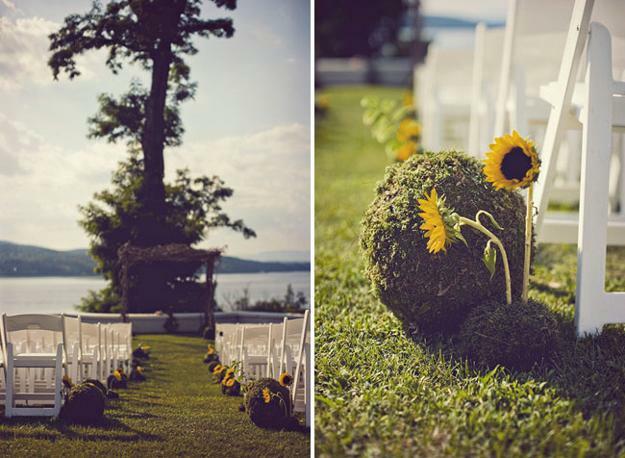 Sunflowers are gorgeous summer flowers that symbolize life and sun, pure thoughts, adoration and dedication. 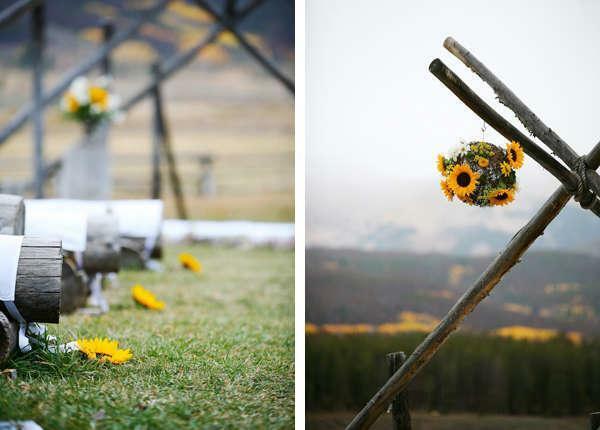 Floral arrangements made with these beautiful flowers are meaningful and symbolic. 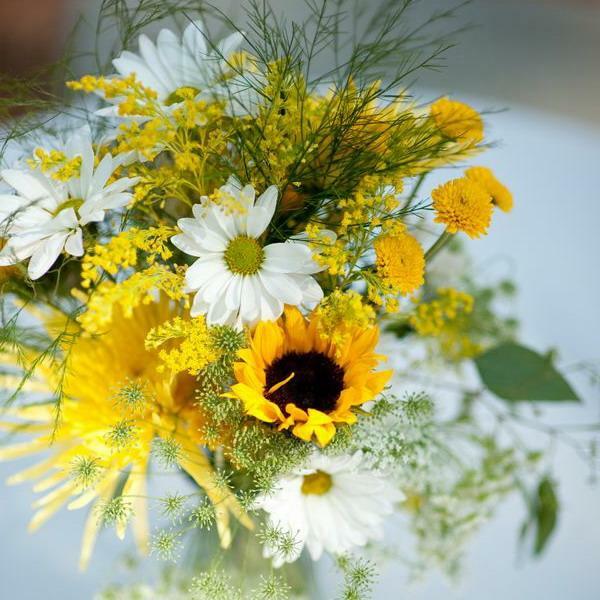 These beautiful flowers are perfect for special even or party table decorations, blending striking natural beauty and meaning into joyous summer decorating themes.